In the bustle and hustle of modern day life, peaceful settings to do our writing is sometimes an elusive thing. Over the centuries many writers have sought refuge in gardens, both private and public. I certainly find that the peaceful environment can be conducive to writing in the generation of new ideas, the consolidation and development of existing ideas or even as places to actually write new material. In today’s photo I’ve shown a very peaceful garden in the grounds of the Fistula Hospital in Addis Ababa, Ethiopia. My wife and I were fortunate enough to be able to have a tour of the hospital when we were in Ethiopia a few years ago. You can read about our experience on my travel site here. The women who come to this hospital have suffered terribly because of this horrible condition. A simple operation usually solves the problem and their lives are transformed. 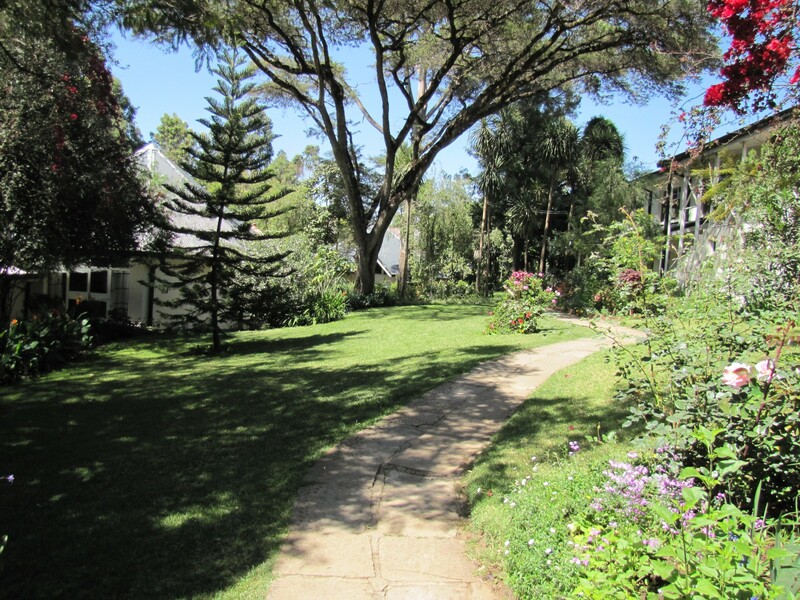 The peaceful hospital facilities, including the wonderfully kept gardens, are a vital part of their rehabilitation and healing. It was amazingly serene in these gardens considering the noise, smell and turmoil of life outside of the hospital grounds. Write about a garden you know well, and explain how it impacts your writing. 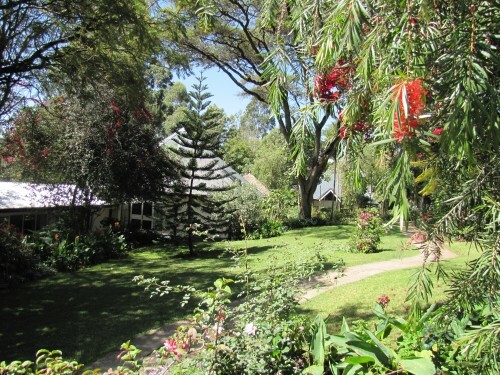 Visit a favourite garden, take pencil and notepaper and record your feelings, or even write a poem about what you see. Visit a well-kept garden – private or public – and take a camera to record what you see. Use some of the photos to inspire your writing. Writing prompts: Who lived here? During our tour of Morocco some years ago now we came across many beautiful buildings. Many of them have exquisite tiled floors, decorated walls and ceilings and were architecturally very interesting. 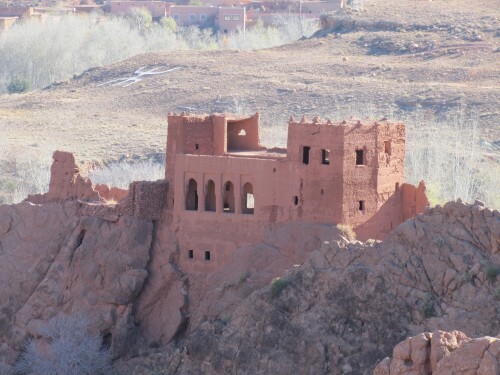 As we travelled through the Berber regions in the southeast of the country, through the Atlas Mountains and the intervening valleys, we came across many abandoned kasbahs, similar to the building shown above. In fact, this photo was taken on the Road of a Thousand Kasbahs. The Road of a Thousand Kasbahs has an exotic and interesting ring to it. Write a story explaining how this road came to be so named. Ask yourself the question: ‘Who lived in this kasbah?” Write about their lives, their romances and perhaps why this was their chosen place to reside. Write about how this particular kasbah came to be deserted sometime in the distant past. Write a series of love poems about a person who had lived in this kasbah, and how their love had been thwarted by political or family events. Research the history of the Berber people or the kasbahs in this region. Incorporate some of your discoveries in a story of fiction, weaving real events into your fiction. Writing prompt: you call that a bridge? That was my first reaction when I saw this structure over a river while on a holiday a few years ago. I was hiking through some interesting country with a small group when our leader took us to this location. He told us that this was where we had to cross the river. We all hesitated at first, but our leader was adamant. We had to cross here or face a three-hour trek back to our starting point. It was either cross here or go back. Our bus was waiting on the other side of the river, a short 50-metre walk. The only stipulation was that we had to cross the bridge one by one. He couldn’t guarantee that it would hold up more than one person at a time. My wife, daughter and I were enjoying this adventurous holiday. That was part of the reason why we were there, faced with this little challenge. Thankfully, the bridge looked far worse than it actually turned out to be. All in our party crossed safely and we were soon on our way on the bus, heading for the next adventure. Use the information I have already given to kick-start your own writing. If this has not prompted some ideas already, use – or adapt – one of the writing prompts I have listed below. Relate the most adventurous thing you have ever attempted – successfully or otherwise. Write about the most dangerous activity you have ever undertaken. Has anyone else ever put you in a dangerous or potentially disastrous situation? Write about what happened. Use the photo as inspiration for a poem. Use my photo as a starting point for a flash fiction story (under 500 words – or whatever limit you place on your piece of writing). Imagine that you had been in the hiking party with me. Write about how I fell off the bridge and how you came to the rescue – or the bridge collapsed when you were crossing. Write a page or two leading up to this point where you have to cross a bridge. As you approach, someone blows up the bridge. Write a story featuring the events which follow. Imagine you are a poor farmer living in the place featured in the photo. Write about your life and struggles and how this bridge is critical to your survival. 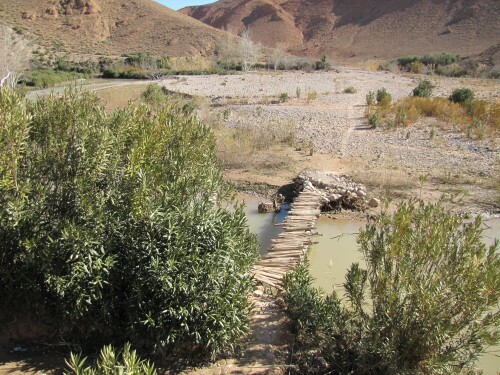 There is a path leading from the river crossing. Write about where you think that this path is heading, and what you will find there. I haven’t stated where the photo was taken. I don’t want to restrict your thinking by telling you. If you really, really must know, use the “Contact” form at the top of the page to send me an email, and I will reply privately.